Why: It’s Vegan Whip Cream!! If someone can look you in the eye and tell you they don’t like whip cream, beware this person because they have no soul! Seriously, whip cream is one of those things that most of us have many fond memories of. When I was a chubby teenager, the very thought of a mound of fluffy white whip cream goodness melting into my hot chocolate was enough to make my toes curl (and then I wonder why I was chubby…) But when I became vegan I was worried that my days of having those happy whip cream moments were all behind me. When I first discovered Soy Whip I was a college student. It was a financial commitment to buy a can, but it was SO worth it when I would get home from taking a stressful test, place a huge mound of whip cream on the back of my hand and eat it off (what? Less calories that way and more control than just squirting it in my mouth). Back then, the flavor was amazing and you could use it right out of the refrigerator. Now, the flavor is still amazing. Soy whip is one of those products that mimics the non-vegan version perfectly. It is amazing and a half! However, in the last year especially I have to admit I have gotten very frustrated at how the product actually comes out of the can. In order to get it to work at all you have to take it out of the refrigerator about 15 minutes before you want to use it, and then try. If it does not come out, you have to wait some more. Calorie control? Maybe, because by the time you are done and can get some out, you’re over it. Unfortunately, sometimes it doesn’t work at all. You invest in a can and none comes out at all! This happened to us this thanksgiving. My wonderful mother-in-law got dairy whip cream for the family ‘muggles’ (non-vegans), and soy whip for us. Unfortunately, then none came out. Our desert was just berries, which was tasty, but we were pretty let down. I got another can after that, and only some came out before it just froze up. 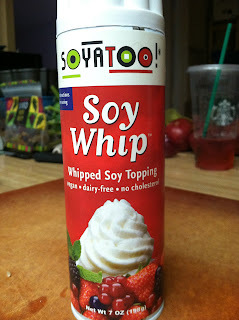 I really hope that Soy Whip resolves the problems that they have with the can, because they flavor is amazing. But just know that it can be a frustrating adventure. Soy (tofu, TVP etc) cause Dementia/Alzhymers. Search Russell Blaylock M.D. for this evidence. You have to hold the can under running hot water to warm up the contents, and then you have to shake the can vigorously before you use it. This has always worked for me, although I admit that it's a hassle.